Crab claws yield sweet, dense white meat similar to lobster meat, while the flesh from under the hard upper shell is soft, rich and brown. 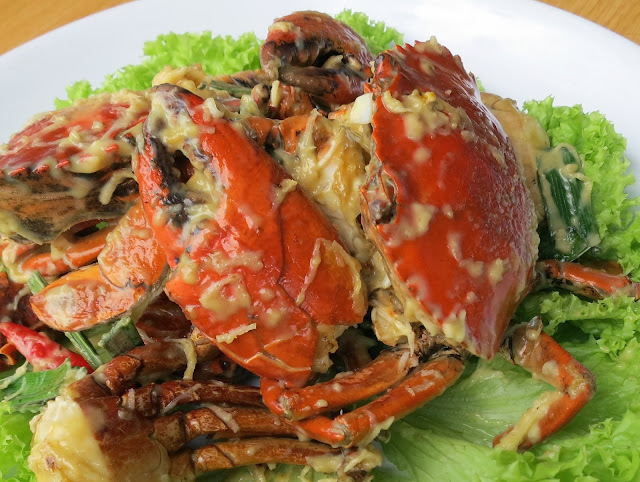 Crab liver is considered a delicacy. Male crabs tend to have larger claws and more white meat. However, the females sometimes contain coral - a flavoursome red roe. 1. Deep fry king crabs for 3 minutes. 2. Meanwhile melt butter in pan and saute garlic. add the grated coconut and coconut cream. 3. Add calamansi juice and season with Ajinomoto Umami Super Seasoning. 4. Add crab and braise for 2 minutes before serving.